I was late to the Instant Pot craze. I was resistant at first, but so many of my friends were raving about theirs, especially the ones with large families, so I broke down and bought one. Actually, I wasn’t even the first one to use it after it arrived. My neighbour used it to make roasts in just 17 minutes and I was sold! Freezer meals are my secret to easily feeding my family, but combining that time saver with this time saving appliance takes things to a whole new level. 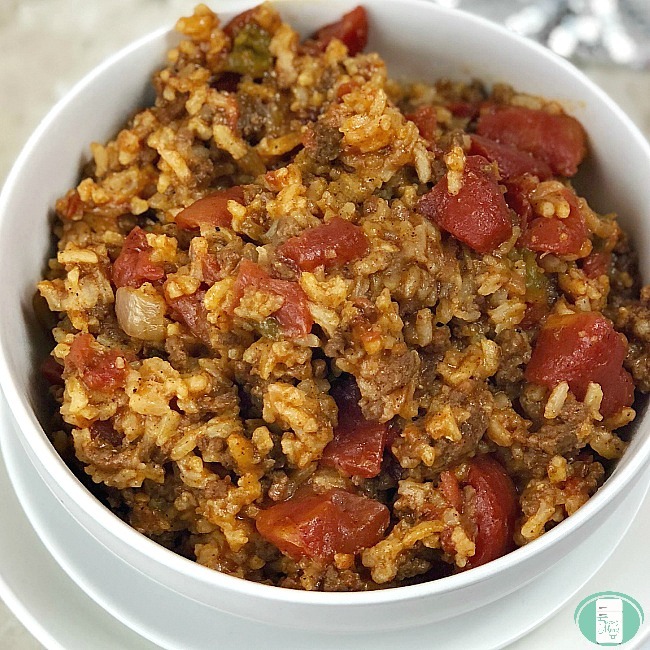 Instant Pot freezer meals are quickly becoming my new go-to for weekday dinners. One of the biggest “a-ha” moments for me when it came to wanting to make my freezer meals in the Instant Pot is that you can cook meat from frozen. 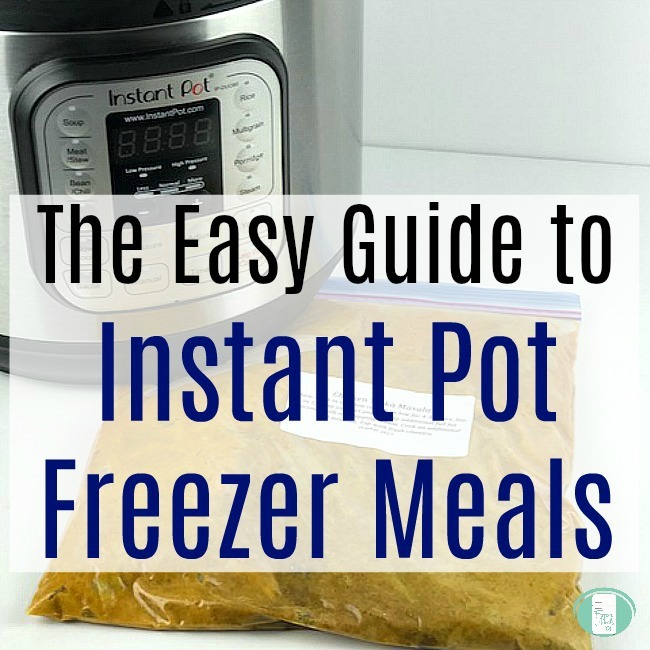 This means that if you forget to take a freezer meal out in the morning or the night before, you can still just pop it into the Instant Pot*. FROM FROZEN. Yes, freezer meals and the Instant Pot really are a match made in kitchen heaven. *Be sure to adjust cooking times for this. 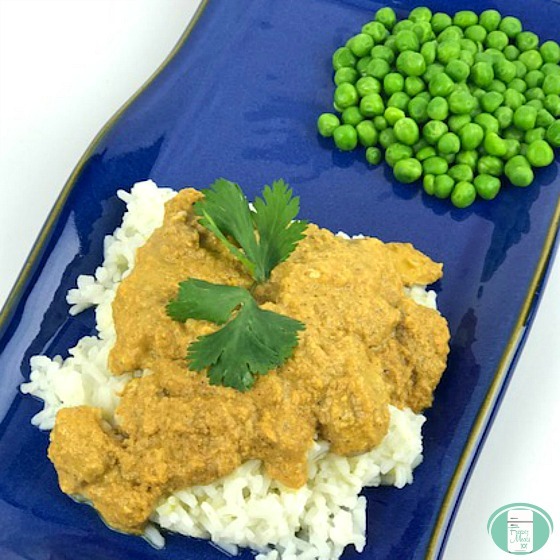 Freezer Meal Thai Peanut Chicken for the Instant Pot from Smart Nutrition – This looks so incredibly delicious! I’m a huge fan of Thai food, so this one is going on the must-try list. Pressure Cooker Kalbi Korean Short Ribs from This Old Gal – Place the marinating meat bag in the freezer for up to 3 months before thawing and cooking in the Instant Pot. If cooking from frozen, adjust the cooking time. 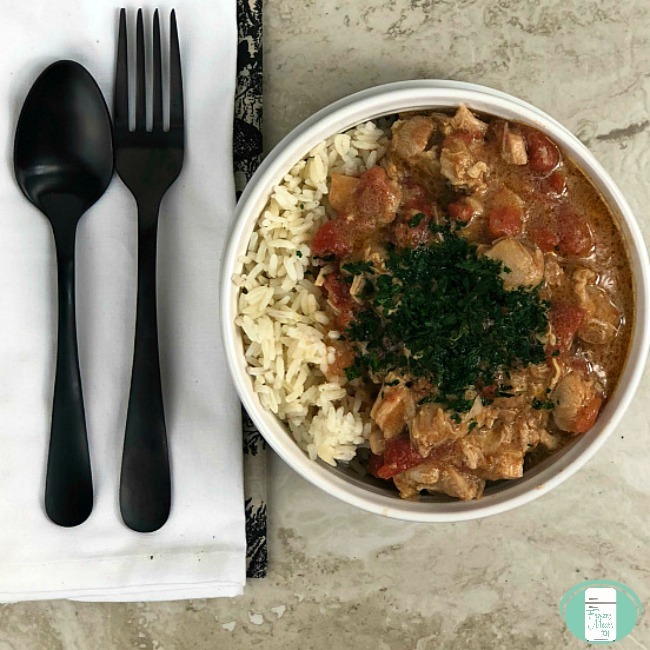 Check out our Instant Pot Freezer Meals Plan which takes all the guesswork out of preparing Instant Pot meals ahead of time. It includes the recipes, prep lists, shopping lists, and printable labels. 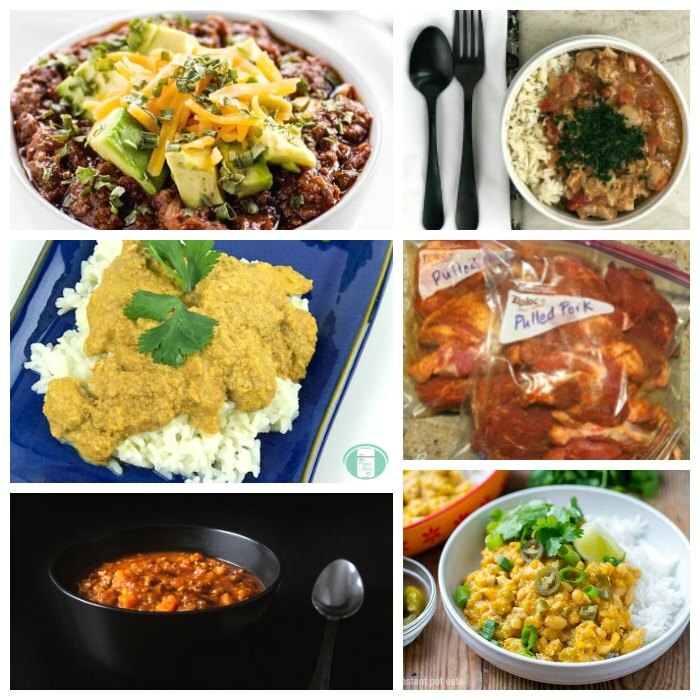 Taking a bit of time to fill your freezer with Instant Pot friendly recipes will be a decision you will thank yourself for again and again! 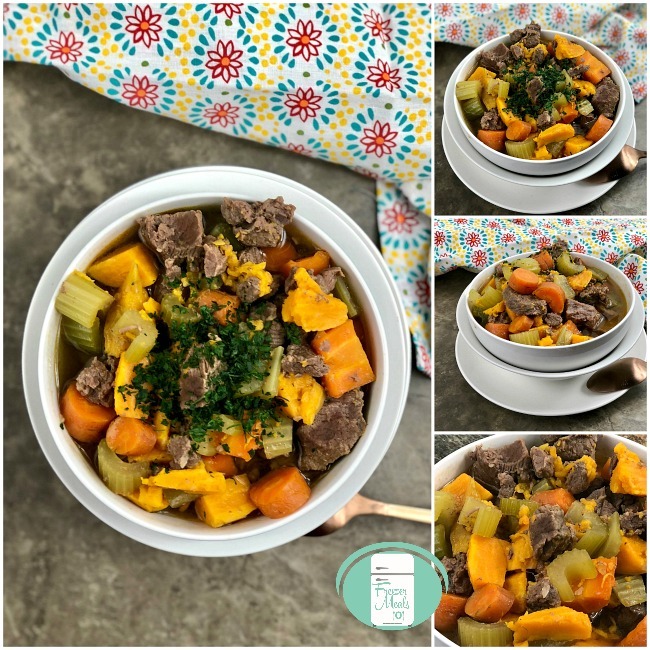 Not sure how to make Freezer to Instant Pot meals? 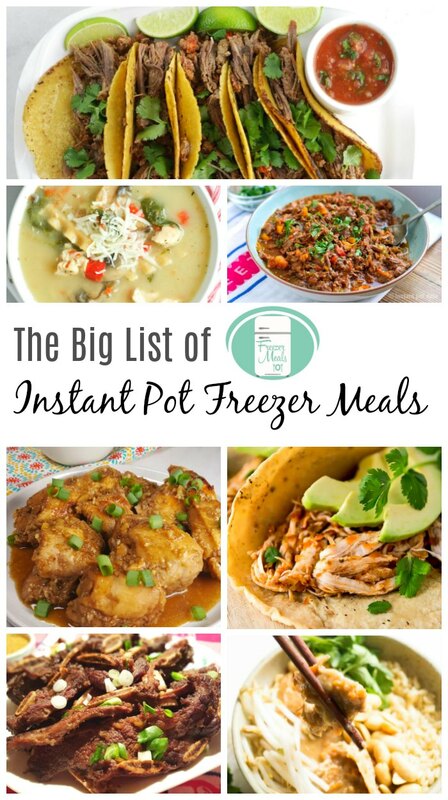 Check out our Easy Guide to Instant Pot Freezer Meals. It’s got everything you need to know including how to convert slow cooker recipes to the Instant Pot. 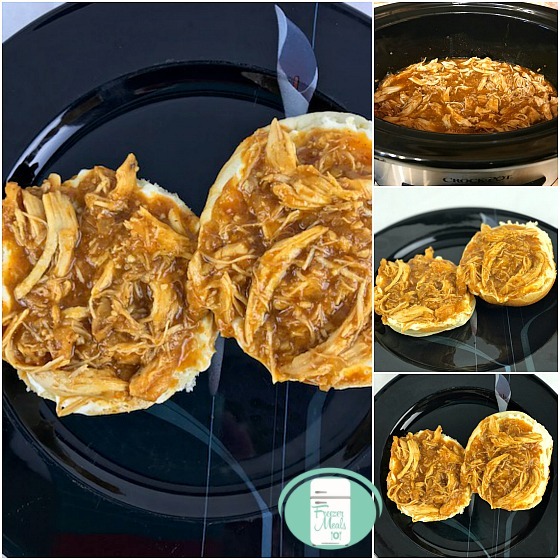 The Instant Pot is slowly growing on me, although I have to admit that I still think of using the crock pot more often out of habit. My friend Michelle had to walk me through how to use it because I’m still new at this. It is more complicated than just plopping the food in and touching a button, but I can see how convenient it is and how much faster it makes cooking. 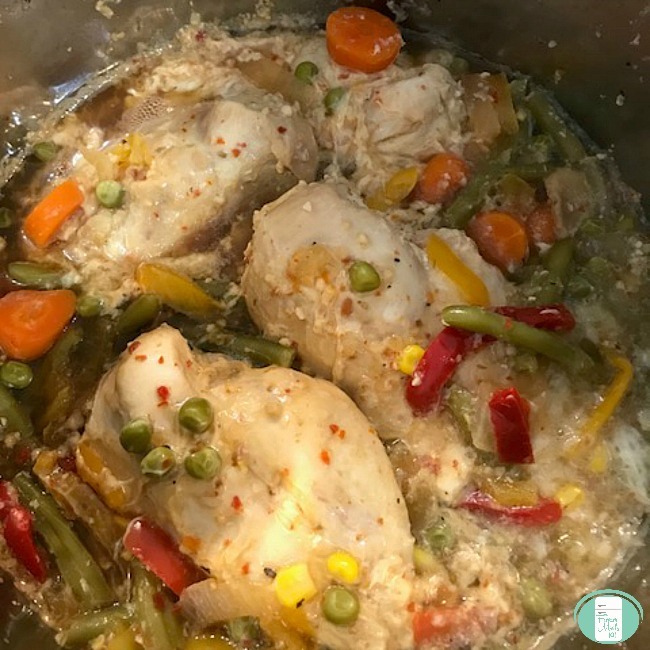 This Instant Pot Italian Chicken and Veggies is a great one pot meal that includes everything. Since this recipe includes the chicken and the vegetables, it really takes the thinking out of making dinner. This is quick and easy but manages to taste good as well. My husband was impressed by how juicy the chicken was in this recipe. The vegetables hold their texture really well in this dish. You can also change up the flavours by using different varieties of frozen mixed vegetables. When putting this together as a freezer meal, place the chicken and all the other ingredients together in a large resealable bag. Squish to combine everything and seal after removing the excess air. Freeze. On the day of cooking, take the bag out of the freezer and thaw. Place the bag contents into your Instant Pot. Lock the cover and seal the steam nozzle. If you’re looking for a starch for this meal, you can serve it with rice or potatoes. 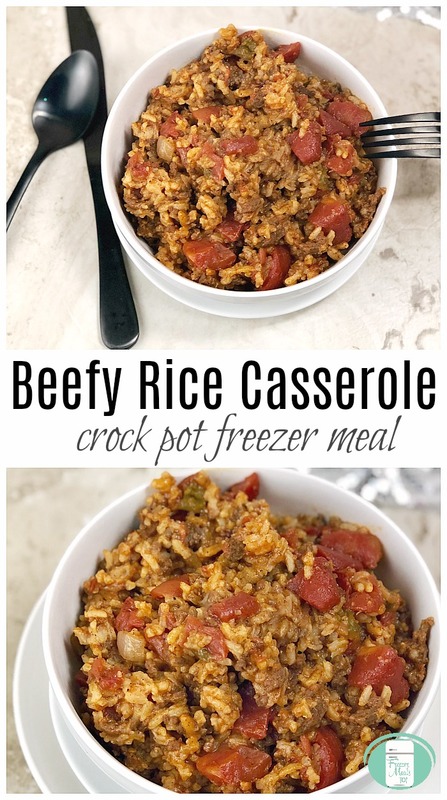 This Beefy Rice Slow Cooker Casserole includes everything needed for a balanced meal. This dish doesn’t have very strong flavours, so it’s a good family friendly freezer meal. Before putting together this freezer meal, brown the ground beef and chop the onion and green pepper. Place the uncooked rice in a medium sized resealable bag and seal. Next, add the browned ground beef, tomatoes, onion, green pepper, and seasonings to a large resealable bag. Squish everything in that bag together. Remove the excess air from the bag and seal. Staple the medium bag of uncooked rice to the large bag above the seal. On the day of cooking, take the meal out of the freezer. Thaw. Remove the staples. Add the contents of both bags to the slow cooker. Add 1 cup of water. Stir. Cook in the crock pot on low for 4-5 hours or on high for 2-3 hours until the rice is the right consistency. 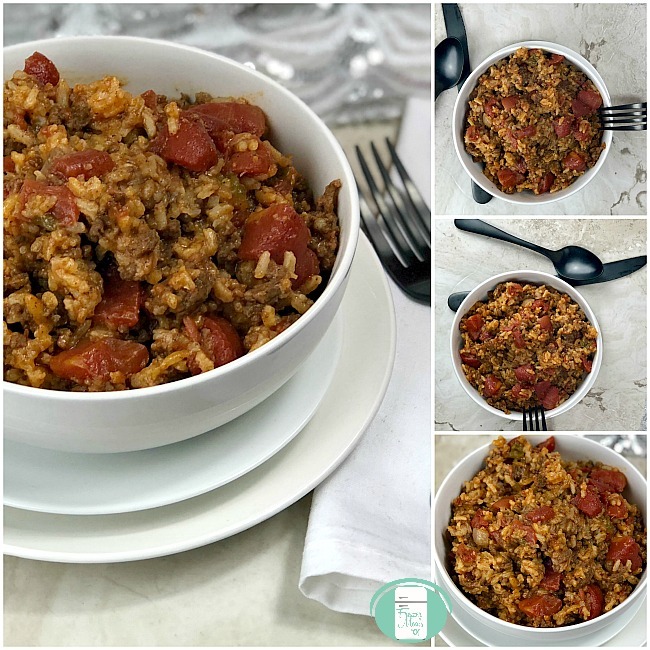 This family friendly freezer meal is included in our Slow Cooker Freezer Meal Plan which has recipes, shopping lists, and printable labels. 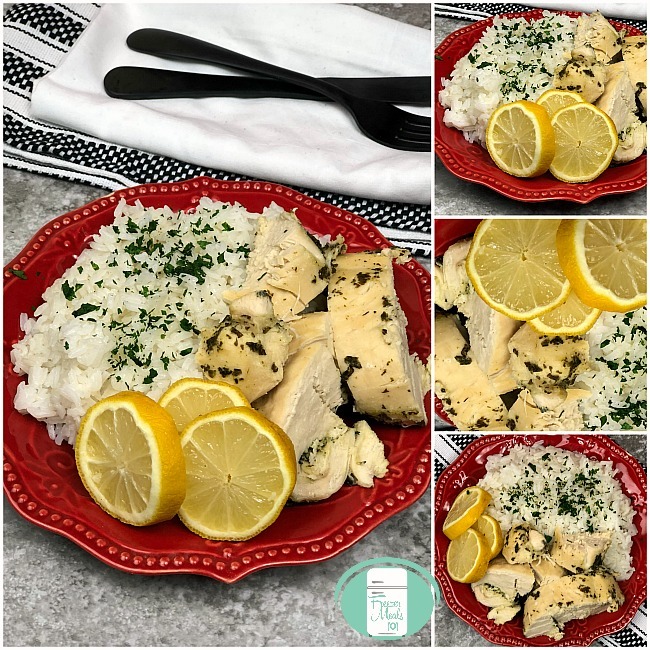 Supper doesn’t get easier than this Lemon Garlic Chicken Dump recipe. It’s a quick make ahead meal that can be cooked in the slow cooker. Dump recipes are probably my favourite type of freezer meal to make. 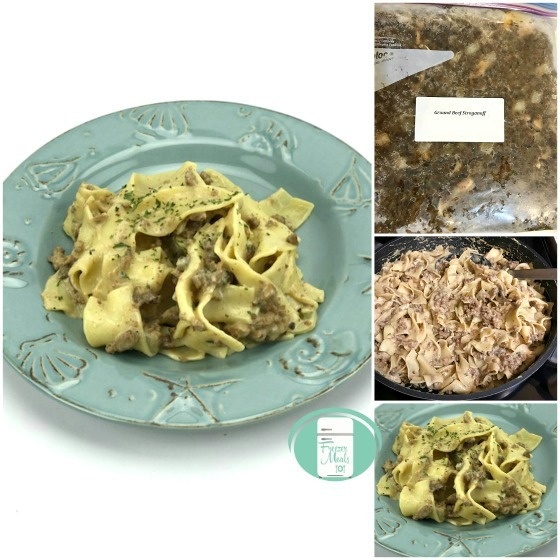 You can easily make ten meals in half an hour to an hour using the dump recipe method. 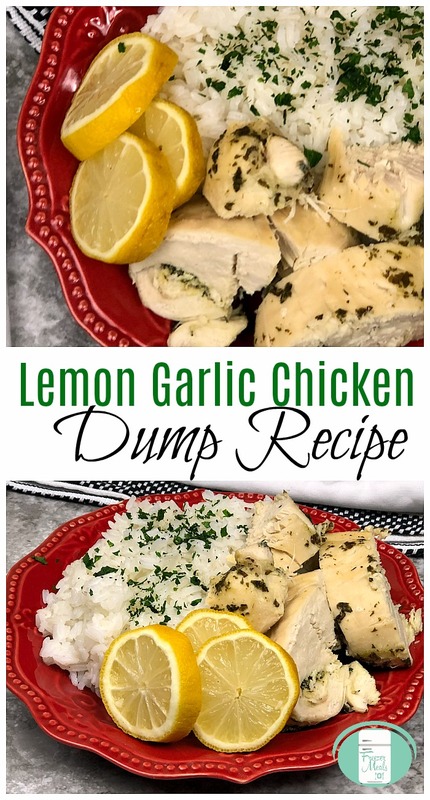 The dump recipe method is basically using only one protein or main ingredient, setting up all of your resealable bags on the counter, filling them with that main ingredients and then dumping the other ingredients called for in the recipes into each bag. Since this is a dump recipe, it is just as easy to make lots of these as it is to make one. Begin by opening a large resealable bag (or as many bags as the amount of meals you are going to make) and adding the chicken. Dump the other ingredients into the bag. Remove the excess air from the bag, seal, lay flat, and freeze. On the day of cooking, take the bag out of the freezer to thaw. Bake in a preheated 350° oven for 45-55 minutes or in the crock pot on low for 4-6 hours. If desired, you can sprinkle some parsley on top. Serve with rice or potatoes and your choice of veggies. 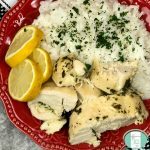 This meal is one of the many simple, yet delicious recipes included in my Chicken Dump Recipes cookbook. Begin by opening a large resealable bag and adding the chicken. Remove the excess air from the bag, seal, lay flat, and freeze. On the day of cooking, take the bag out of the freezer to thaw. Bake in a preheated 350° oven for 45-55 minutes or in the crock pot on low for 4-6 hours. Serve with rice or potatoes and your choice of veggies. One of the things I get asked about a lot is side dishes to go along with some of our other freezer meal recipes. 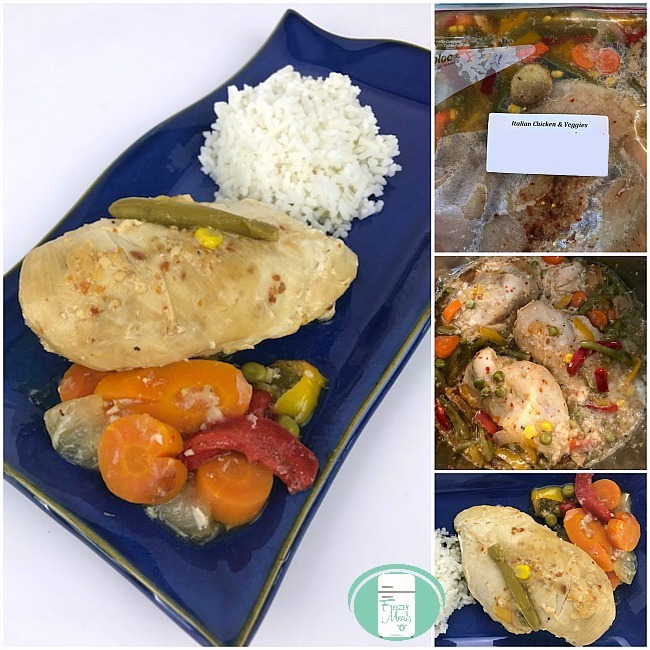 Many of our freezer meal recipes include everything needed for a meal, but some of them such as the meat and marinade types need to be served with a side dish. Something I have started doing more and more lately is making side dishes that freeze such as this butternut squash recipe. Having side dishes in the freezer as well allows me to pull out a main and a side dish together and have supper completely done ahead. I have a little trick for making butternut squash easier to peel and cube. I put the entire squash including the skin into the microwave for a minute or two. This softens it just enough to make peeling and cubing simpler. 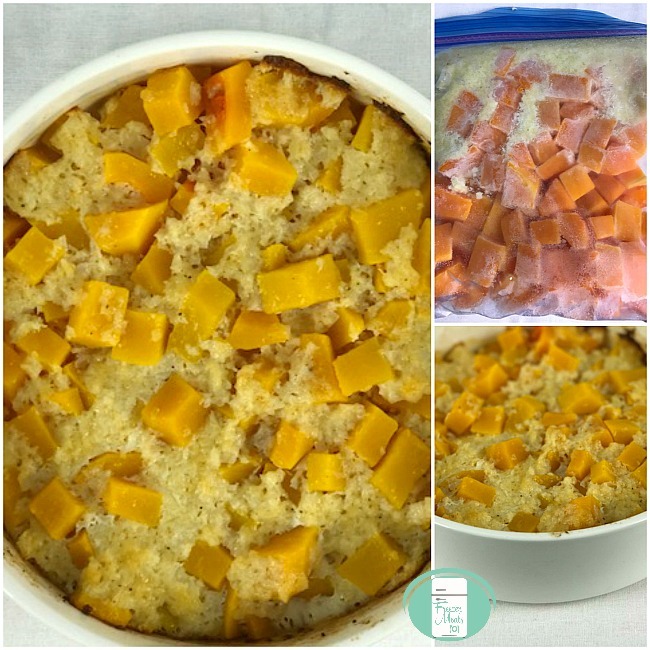 Place the chunks of butternut squash into a medium sized resealable freezer bag. There are two options for assembling this side dish. If you want the Parmesan and breadcrumbs as a topping, you can place the other ingredients into a separate medium sized freezer bag and staple the bags together. Otherwise, you can place all the ingredients into one bag. Remove the excess air from the bag(s), seal and freeze. On the day of cooking, thaw. If you made it all in one bag, place the bag contents into a small, greased oven safe cooking dish and mix. Bake, covered at 350° for one hour. 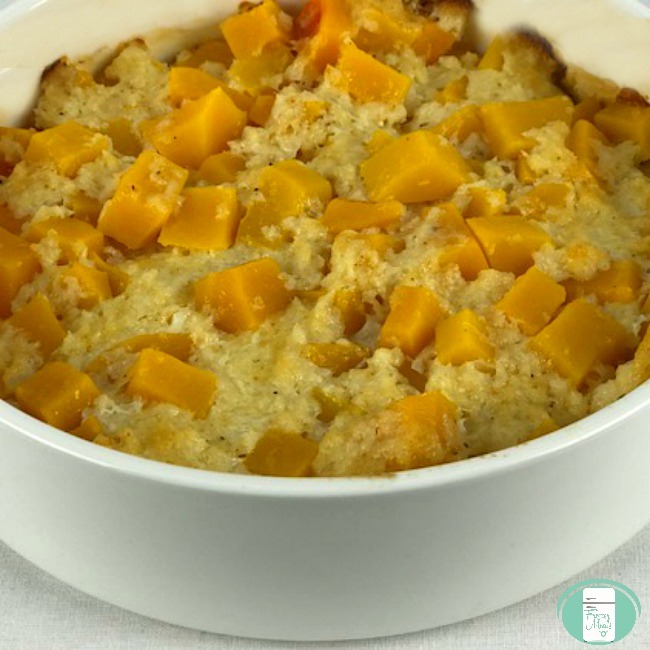 If it is in two bags, place the butternut squash in a small, greased baking dish and top with the topping from the other bag. Cover and bake at 350° for one hour. I was so relieved to have several of these side dishes in the freezer at Thanksgiving. There is so much to do that day and so many things to cook. Having something to pull out that’s ready to cook made it so much easier. Of course, I pulled out several bags so that there would be enough to feed our family and some extended family gathering together that day. 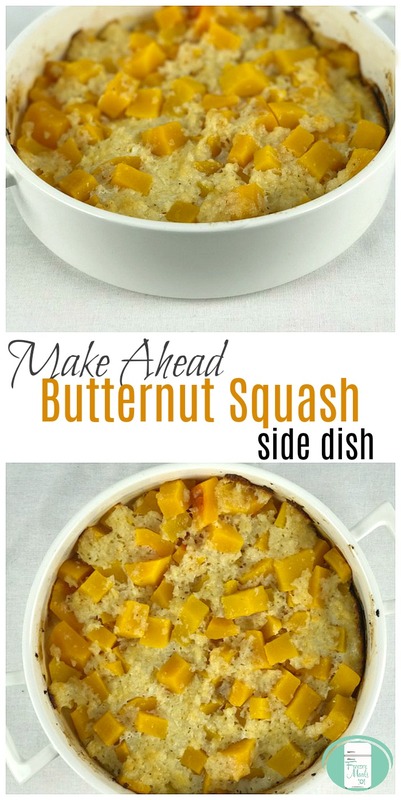 This side dish would be great for Thanksgiving, Christmas, Easter, or any other group meal.